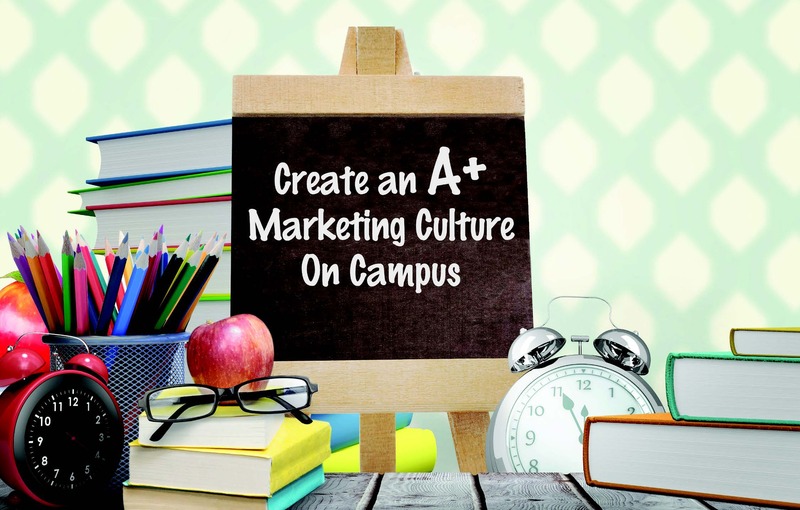 Make Marketing A Campus-Wide Effort - O'Connor & Drew P.C. During difficult economic times marketing departments, once comprised of five or more employees, have whittled down to three or even fewer individuals. Often, the marketing staffers that remain oversee everything from content creation to print and digital media to PR and events and more. So, if hiring more marketing help isn’t in the cards for an institution, what can you do to leverage the resources that you already have? Here are five strategies to give your marketing department a bit of a lift. Are you the only one who is creating content on your social media channels? Are your posts getting shared, getting liked, getting retweeted, or just not getting much of anything? If so, there is some good news. According to the software company Tableau, as of 2018, 77% of people in the US have at least one social media account and this statistic is probably even more true of your campus community. Plus, most likely, your campus is comprised of both the young, the old, and everyone else in between – all of whom are fans of different social channels. Use their activity on these different channels along with the size of their individual networks to your advantage. The algorithms that now run on social media channels like Facebook have greatly increased in complexity; so, when you as a university post something, it is not even seen by the majority of those who like your page never mind the coveted people who don’t yet like your page. If members of the campus community share or even just simply like your posts, your audience reach multiplies exponentially. Leverage this great power and reach out to the campus community– employees and students alike – to encourage them to become fans of your page if they aren’t already, to support the page by liking and sharing posts, and even encourage them to create new content themselves. Perhaps run a contest where the post of the week gets some campus gear or the person who shares the most posts gets a gift certificate to the bookstore. Maybe have a scavenger hunt on campus where to win students take pictures of items that they find. Then, you could provide fun facts about the item, building, etc. and describe why it is unique to your campus showcasing to your followers another reason that the item makes your school a great place to be. In the end, remember that while it is nice when you say that your organization is great, it is one hundred times greater when others say it for you. The most successful organizations do not put restrictions on their employees’ ability to contribute. Along these same lines, the most successful employees look for new ways in which they can improve their organizations outside the scope of their job descriptions. Creative marketers can be found everywhere. Make it known that all ideas are welcome. In addition, if you can create a culture where marketing is a part of the employee mindset, others may see an opportunity to market your university in a unique way during their daily routines that you otherwise may have missed. One idea would be to create a marketing committee of employee volunteers which meets monthly. Let these employees in on the university’s marketing initiatives before they become mainstream. Letting them be in the know will create more “buy in”; letting them know that they are truly part of the process, that they have a voice, and that they have a platform to contribute. If your university has marketing students, these students want and need real-world experience. If you cannot afford to pay students for an internship, consider asking the university for the ability to offer these students some tuition-based aid. If that’s not in the cards, maybe approach freshmen and sophomores who do not yet have any real-world marketing experience. Working for the university’s marketing department, even for free, would be a great resume builder for them to land that coveted first marketing internship position in their junior year. If you aren’t sure where to start in finding these student gems, first meet with marketing faculty. They know the stars in their classrooms and those who might make the greatest contributions to your department. The time commitment wouldn’t have to be much – just a few hours per week. At the very least, these student interns could tackle projects that would get the department more organized that you would have no time to focus on otherwise. Last but not least, these students probably already love your university, or they wouldn’t be enrolled there. Moreover, not too long ago, these students were evaluating their college options. It would be of great value to you to interview them and find out some of the reasons why they chose to attend your university over your competitors. Also, find out some of the things that drive them and what they are passionate about. These have the makings of a great marketing campaign. Tap into the network of alumni who are passionate about your university and find out what their degrees have done and are currently doing for them. Ask them to share their favorite memories from their college experience and what they have done personally and professionally since graduation. Ask them if they remain in contact with their college friends and professors. Find out if your career services department helped them to land their first job. Potentially feature an alumni story of the month on your social channels. There are countless alumni that have great stories to tell and would be more than willing to share their insights for free if you just ask. There are countless tools out there that help make marketers’ jobs easier and more automated – many of which don’t have too much of a learning curve and come with a relatively low-price tag. Sprout Social and Hootsuite that allow you to preschedule your social posts for the week all in one fell swoop. Video creation tools like Biteable, Adobe Spark, and VideoMakerFX which help you to create professional looking videos right in-house. Constant Contact or Active Campaign for email distribution and email list building. Make a list of your daily activities and overall marketing objectives. Then, identify the areas where automation will make the greatest impact and evaluate the cost and implementation of some of these great tools. Want new articles before they get published? Subscribe to our Education Advisor Newsletter.